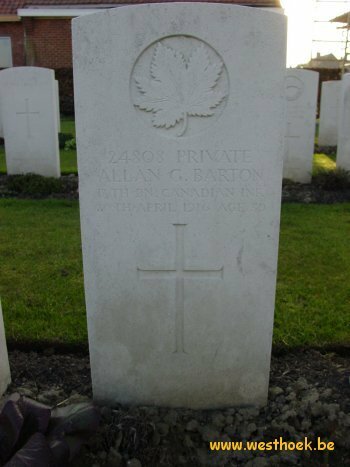 Private ALLAN GORDON BARTON DFC 24808 13th Bn. , Canadian Infantry (Quebec Regt.) who died on Thursday 20 April 1916. Age 30. Son of William A. and F. Barton, of 1232 Beacon St. Brookline, Mass. Born at Boston. Mass. CEMENT HOUSE CEMETERY Grave XVIII. B. 25.